My head wants to drop down in shame. This reminds me of when I first contact you from Boston some years back. I think it has to do with disappointing my father. I wonder if you can help me with this issue. Thank you for raising this issue. Disappointment may have a positive intention of letting you know you don't realize your expectations. Shame may have a positive intention of motivating you to stop doing something shameful. You might consider taking your feelings about <disappointment> and <shame> to Tribe as entry points. I show up at Tribe with a 3-page list of issues and goals for the Rocks Process, including wanting a relationship, tightness in my throat, listlessness and sadness. The Process Manager duly notes my list and my willingness to work, and invites me onto the hot seat. He also tells me to put my list aside as he intends to proceed by reading my forms in the now, not by following my script. Then he notices my thumbs and little (fifth) fingers keep twitching. He asks me to amplify the motion. I feel a little uncomfortable about that - as if I have to display some kind of strange twitch or tick in public. With continuing encouragement I find myself extending the twitching motion into a form of stretching my fingers apart from each other, until my thumb and little finger lie on the same axis, pointing in opposite directions. This feels a little painful and curiously satisfying. The Tribe keeps encouraging me to crank it up so I keep making my hand bigger and bigger. Then I stretch out my arms and push my hands into the air. I do not know what this means, except that it feels good and that I like doing it. The Tribe keeps encouraging me and I really go for it, full out. Then it hits me. I want the teacher to call on me and I want to get my hand way up in the air and get my hand as big as possible. I also feel frustration that I know the answer and she does not call on me. She calls on the other kids, many of whom do not know the answer. So here I sit, with my hand up in the air with my fingers spreading out so far apart they hurt. And still no response from the teacher. Then the critical incident pops into view. I figure out how to read before most of the other kids in the class. So, naturally I know what the book says and I know the answer to all the questions. Now, I want some acknowledgment and recognition. If only she would call on me. The teacher, however does not want to call on me. She has other concerns, like encouraging the other kids. She sees me as a distraction. She calls my parents into school for a conference. My parents and the teacher set down the law for me. I may not raise my hand in class until and unless every other student has a chance to answer the question - and fails. That actually happens quite a lot, so I get to act as the clean-up guy when nobody else gets it. 1. I have to hold back. 2. I have to go last. 3. I do not deserve support. 4. I can expect betrayal. I notice these patterns showing up all through my life. I settle for second best and I hold back on expressing my thoughts and feelings. I don't do well in organizations and I don't form close relationships. Next, the PM sets up a role play to confirm the scenario. It fits. Then, we re-run it. On the re-run my father stands up for me and tells the teacher off. He says he does not tolerate anyone telling his son to hold back or settle for second best. When I hear that, a wave of emotion rises up inside me and makes me want to cry. The teacher also changes her style. She no longer has people begging for attention. She calls on all the students, one at a time. Then she also has speed rounds, in which she calls out a question and the first person to shout out the correct answer wins a dollar. I win most, and not every, round. The speed round gets a lot of interest going in the classroom and some of the other students catch on that if they take their books home and study, they can win a few bucks too. At the end of the process, I feel differently. I notice most of the stuff on my list matters very little anymore. The PM notices that I now walk around with my thumbs up, rather than in my historical pattern of hiding my thumbs in my fists. Since the meeting, I notice many things falling into place for me. I thank my PM and Tribe for helping me with this breakthrough. Thumbs up to all of us. Thank you for sharing your process and for documenting your process. I recall speaking with you some years ago about your systems, and the 5 or 6 basic areas of concern which must always be addressed to constitute a complete trading system. I cannot recall this list completely. I am wondering if you might willing to describe that list briefly, in a FAQ reply. Addressing areas of concern (an action) does not constitute a trading system (an object). You might consider taking your feelings about <wanting a complete list of components> to Tribe as an entry point. Thank you for sharing your feelings and for sending me this link about the passing of Jay W. Forrester, whom I regard as one of my most important teachers. 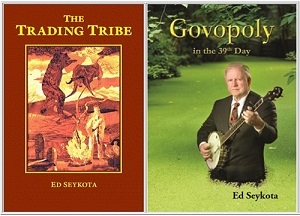 Some of his philosophy and some photos of my last meeting with him appear in my book, Govopoly. Jay lives on in the hearts, minds and actions of those who carry his spirit and those who benefit from his many insights and inventions - in other words, just about everyone. Thank you for your time.I have never being mentored but I have a plan. time for the ideas learned. After that, I send you a doc where I write my actual path, my actual path could be the ideas tested and ideas not tested with an explanation. plan could be totally different, so I would like to listen your thoughts about a long-distance mentor-apprentice relationship and discuss mine. Thank you for sending me your mentoring plan. This seems to fit withing the scope of FAQ. You may continue to send questions to FAQ so that my readers can follow along with your process. FYI your website is down again. Last night, The city of London Tribe held its regular monthly meeting. Two newcomers attend. One elects to be first on the hot seat. I find it amazing how easily he is able to get into forms despite never witnessing the process before. Both newcomers realize the importance of a strong field of acknowledgement and improved their effort and intensity at receiving as the night goes on. I go last on the hot seat. I go through many forms that I associate with frustration, despair and finally elation. I notice that this seems to be a recurring theme with my trading. I have large set backs, I get to the point of despair, I pick myself up again and experience some sort of elation at overcoming the draw down and moving forwards. This is my fourth Tribe meeting and I notice that I seem to always get to the same feeling. It feels like a snake moving around in my chest and throat, when I try to focus on it, it seems to disappear, only to re appear moments later. I label the feeling as a mixture of anxiety / excitement. I realize that intentions = results, that I am getting what I want. I connect this snake feeling to my wanting to feel the anxiety / excitement. I get exactly what I want by taking large losses, or missing opportunities by not sticking to my process, and then sticking to my process, taking good trades and having a period of good performance. I say out loud that I am feeding a beast inside of me. The process manager asks me how I would feel if the beast was slain. I say I would feel sad. He asks me to feel sadness. I get onto the floor and go through my forms associated with sadness. I begin to enjoy it, I feel like I have not felt like this since I was a child. I feel like its the first time in decades since I have felt this sadness. I like it. It feels soothing and I enjoy being able to experience it fully. Unfortunately, time runs out for our meeting. But I feel this was a good place to end and I look forward to exploring sadness and this beast / snake feeling further. I have attached an updated Tribe sheet for your website. By the time it's on the cover of The Economist, the trend is over. Last night our Tribe meets. We have four in attendance, including a new member. Tribe members spend most of the meeting on the hot seat in feeling mode. I am very thankful for our collective willingness to work. We freeze each hot seat at what appears to be a peak and we do not identify any early childhood critical events. We unearth many forgotten early childhood memories. Members report new insights into behavior patterns. Tribe leader reports feeling hot and Tribe encourages him to take the first hot seat. He reports intentionally derailing a very profitable trade, being in a fog, not realizing his potential, and feeling frustration. His forms are crouching, coughing and hacking, rubbing his legs, squeezing and rocking. This may be a signature form as it appears in previous meetings. Although he says he is willing to take the feelings as far as he can, he is not able to recall any specific critical incident other than being in a Doctor's office and choking or vomiting. He has no recollection of a parent being there. He is unable recall any important details other than the feelings themselves. I am not sure the Tribe leader is using TTP medicinally, as he does not report relief post-process and feels ill after the meeting and the next day. I wonder if you might have thoughts on how our Tribe leader might progress further into what may be a signature form. Our new member takes the hot seat. He displays a form of wearing concrete shoes and not being able to move. His form becomes very intense and Tribe encourages him to go with the feeling. He smiles and seems to enjoy the feeling of being stuck. He reports wanting to improve communication with his parents. The third hot seat reports recent stressful events in his life. He works through the deaths of close family members and health issues that may be involved with giving up trading for a living and job hunting. He crouches into a ball and reports everyone is kicking him when he is down instead of helping him. After the process, he reports feeling like a porcupine that shoots out its quills, and how he might be misinterpreting other's actions. Our fourth hot seat displays forms of itching, lifting his heels, coughing and a knot in his shoulder. With encouragement, he is able to make the shoulder knot bigger. I feel awe as he goes deep into his forms. He freezes and we ask for an early childhood memory. He recalls standing on the roof of his home with his father as a wildfire is approaching. Though I imagine this as a very stressful event, he does not report any stress during this incident. He realizes his coughing feeling is exactly the reflex his father displays while putting on a tie. He also recalls playing with his father's exercise equipment and hurting his shoulder as a child. He does not report much stress in any of the memories. At checkout, one of his insights is that he wants to copy his father's lifestyle, even though he does not have his father's resources. When anger comes up during our final process I recall your entry on January 18, 2016 "Managing Anger": According to Joan Rivers, "Anger is a symptom, a way of cloaking and expressing feelings too awful to experience directly - hurt, bitterness, grief, and, most of all, fear." I feel joy when a tribe member reports noticing better communication with co-workers since attending tribe meetings. A recurring theme that keeps coming up at the meeting is, like it or not, we default to our parents' behavior patterns. Parental drama we observe and complain about may become our drama one day. With this in mind, I want to accept my parents as they are, including the parts of me they do not accept. I realize that our time is so short on this planet, and life is so precious. Connecting emotionally means so much more than engaging in drama, no matter how enticing and medicinal drama may be. The Rocks Process naturally leads people to re-experience a critical incident. If you do not get this result, you might notice where in the process you "choke off" the emergence of the form. You might consider taking your feelings about <choking>, <coughing> to Tribe as entry points. I'm feeling a bit numb. I haven't left the house in over a week. Have been eating pizza and Chinese food. I have dreams of being at my house in VA and somehow in my waking life. I feel similar feelings or similar numbness about when I first moved to America. Everything seems still and a bit stale. I don't know if this is my way of healing or circling back through this episode in my life or if I'm repeating the circumstances of my childhood. I feel lethargic and sad and I don't know what to do. My face frowns. You mentioned a while back that I wasn't trustworthy. I wonder if the trip process can teach me integrity. Where are you? I'm scared of my anger. And I cannot accept anger in others if I cannot accept it in myself. And I think certain parts of the world are getting angrier. It's been a month since you posted on FAQ. I want to reframe my anger with your help and tribe. Since I last talked to you I have two dreams where you appear. One was where I was drowning in the water and you stand on a rock. And you tell me that I like this, in an accepting way. Accepting that I like to play drowning and ask for help. The other one, involves me walking down a commercial Street through some restaurants. I meet you on the street and we shake hands. I feel a shock from the contact. We walk down the street and you tell me that you can have me "clear" by tomorrow. We bump into my sister, (the one I tell you about with the slight pushing feeling from my chest) and I introduce you. I invite you for some roast duck in a Chinese restaurant and you agree. Then my sister's boyfriend and his friends arrive in the same restaurant. You and I sit at a table while the group sots at a different table. Then you got sick hunch over and go to the bathroom. After my dream your website goes down for a few days. I worry if I "caused" your site to go down. Anyways hope you are better and can help me get clear. Thank you for sharing your process and for providing your theory about my web site going off line.